The City of Jeffersontown has grown tremendously in regards to their technology use over the last six years to now include a solid infrastructure that supports their buildings and employees while enhancing the city’s transparency and efficiency. One major challenge they faced was the ability to communicate with employees across five different buildings while also being mobile throughout the day. The existing phone systems in their facilities did not directly communicate with one another and they had no interface with the existing email system. In addition to system repairs, City of Jeffersontown was in need of multiple incoming phone lines for each facility. In order to provide them with the best solution, we installed an NEC hybrid phone system that uses Voice Over Internet Protocol (VOIP) and Analog technology to link all five buildings on one telephone system. This single system was installed using two physical locations to add redundancy to the system for failover — an especially crucial step, as one of the facilities is their police department. They now have three-digit extension dialing that reaches all buildings from one switchboard operator, voicemail to email functionality, on-hold messaging, conference call abilities, and redundant carrier circuits to maximize the system’s uptime. We were able to facilitate major cost savings on the cabling infrastructure which keeps the telephone system operating. By installing a mixture of underground fiber optic cable, wireless connections, and VOIP technologies, we were able to create a single network that eliminated the need for incoming phone lines to each building. 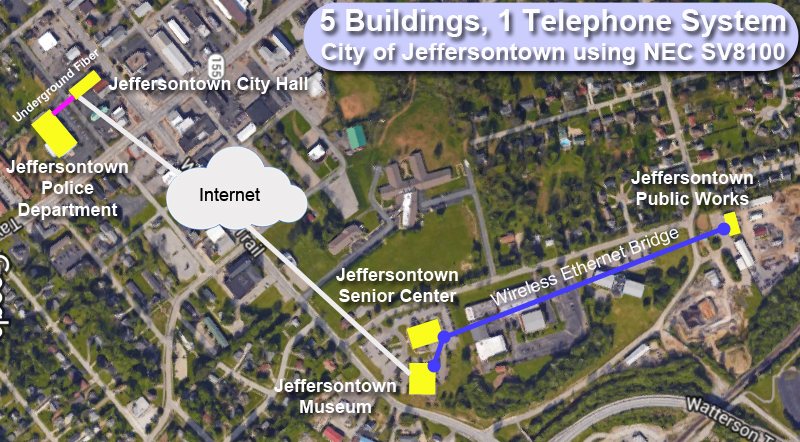 The City of Jeffersontown now has two incoming circuits in two separate locations that are shared between their data and voice networking traffic. Redundancy and cost savings alone made this system a great solution, and the plentiful features of a new NEC phone system make it a useful business tool.